It only takes a second for a boater to fall into the water from their boat, often with hazardous consequences. They may be struck by the boat propeller, or the boat may continue across the water leaving the person stranded or go around in circles striking anyone in the water. Emergency engine/propulsion cut-off devices, sometimes referred to as an engine cut-off switch or “kill switch,” are a proven safety device used to stop the boat’s engines should the driver unexpectedly fall overboard. A mechanical lanyard is designed to attach between a passenger/operator and the system that stops the engine under emergency conditions. These devices are installed by the manufacturers of the engines, but few laws require them to be worn. Stern and Propeller Danger: Remind boaters about the hidden danger at the stern of a boat and the propeller. In an accident, a propeller can amputate or maim an individual. Engine Cut-Off Device: Take the opportunity to discuss the latest engine cut-off device technology, which are designed to prevent propeller injuries. Reference State Laws: Remind boaters of the state laws when it comes to reckless operation, such as bow riding or to dangle legs in the front of the boat while it is underway. 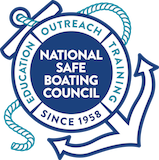 Safe Speed: Remind boaters it is their responsibility to operate at a safe speed.